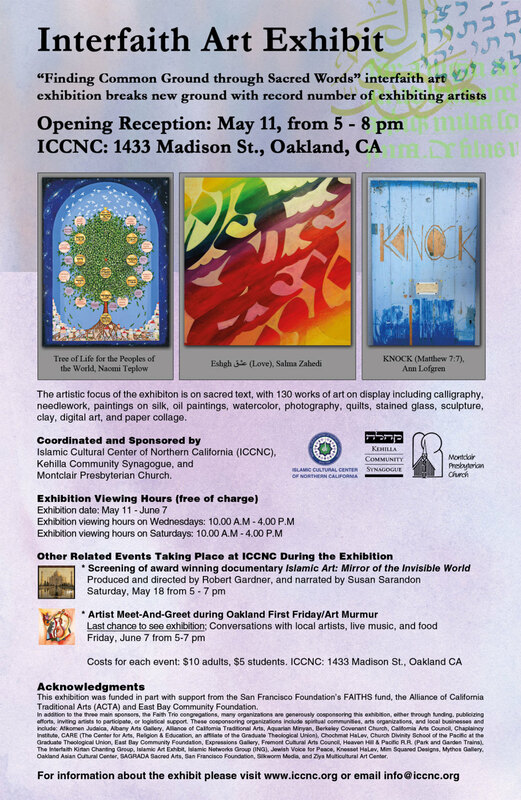 On Saturday, May 11, from 5 to 8 pm at the Islamic Cultural Center of Northern California (ICCNC), the second Interfaith Art Exhibition Biennial “Finding Common Ground through Sacred Words” opened with a public reception. ICCNC is one of three congregations that, along with Kehilla Community Synagogue and Montclair Presbyterian Church, make up the ‘Faith Trio,’ hosted and led this program. The artistic focus of this exhibition was on sacred text, with 130 works of art on display including calligraphy, needlework, paintings on silk, oil paintings, watercolor, photography, quilts, stained glass, sculpture, clay, digital art, and paper collage. Each work somehow incorporated words, text or letters in unique expressions that underscore interfaith understanding, spirituality, peace and cultural dialogue. Artwork has been submitted to the exhibition that incorporates writing in English, Hebrew, Greek, Arabic, Runes, Farsi, Korean, Chinese, and more. To visit the online gallery of 2013 artworks please CLICK HERE. The second Interfaith Art Exhibition Biennial opened on May 11, 2013 from 5 to 8 pm at at the Islamic Cultural Center of Northern California (ICCNC) with an inspiring and beautiful display of artwork. All the artwork reflected the theme by including some text or letters (any language) to convey the message of interfaith understanding. We planned and led five public programs in the course of the 2013 exhibition and in relation to the theme and goals of it. These programs included a mural workshop for children, inter-cultural calligraphy workshop for youth and children, the opening reception ceremony of the exhibition, school visit by MPC, and Artists' Meet and Greet with Music. There was also an interfaith art exhibition inspired by and guided by our exhibition curated at the Marin Jewish Community Center on April 2014. To learn more about the these public programs please CLICK HERE. We are planning to design and publish a digital version of the 2013 exhibition book in the near future (around Fall 2015). This book will be available for downloads with a minimum price. All the proceedings will be allocated toward the upcoming interfaith exhibitions. If you are interested in pre-ordering this book, please send us an email with "2013 Exhibition Book" in the subject line of the email.